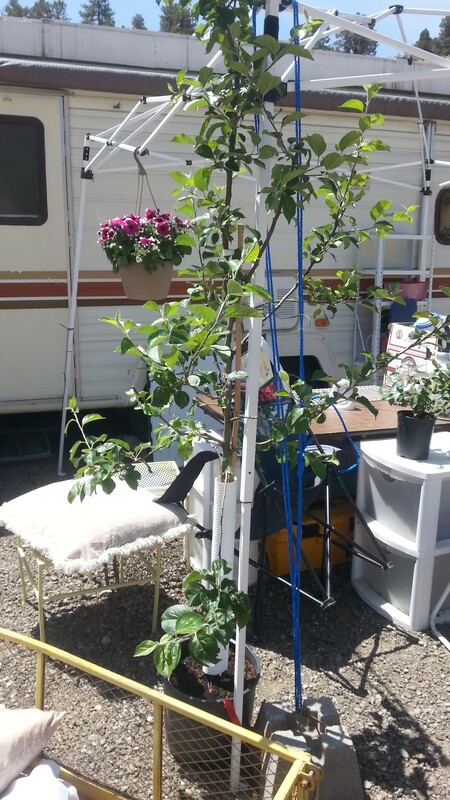 “I bought two apple trees today. It’s the first time I’ve ever bought a tree. We always said we wanted to plant some trees, especially fruit trees. But we never did. The whole eight years since we bought our first house and we never once bought or planted a tree. There was always an excuse. We didn’t have the money. The best season for planting wasn’t there yet, or already passed. It was too hot to be digging holes. It was too cold to be out digging holes. The ground where we wanted to plant was too hard/rocky/frozen/wet/etc. And the list goes on and on. Read the rest (and see pictures) at http://www.heritagehomesteaders.com/nows-the-time (Link does not work, see below). Edited: So, if you clicked through to the link recently you have discovered that is is not working. That’s because the blog owner ran into some financial difficulty and shut down the blog. I guess he couldn’t afford the hosting any more. Sad 😦 At any rate, since the original website no longer exists, here is the full article. 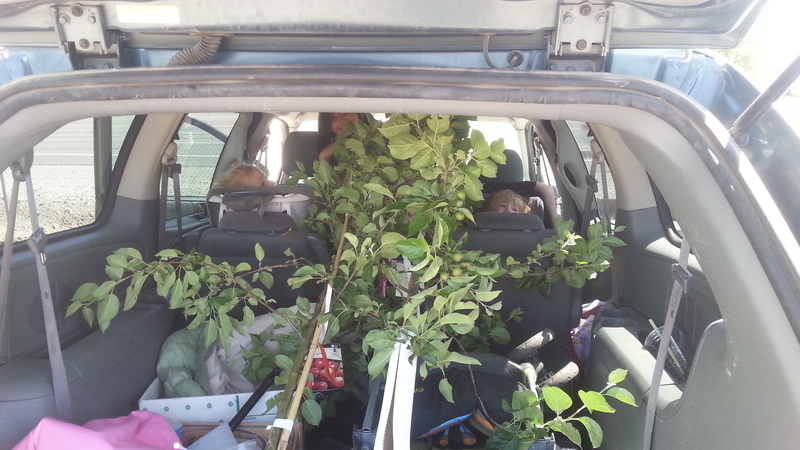 I bought some trees today. It’s the first time I’ve ever bought a tree. We always said we wanted to plant some trees, especially fruit trees. But we never did. The whole eight years since we bought our first house and we never once bought or planted a tree. There was always an excuse. We didn’t have the money. The best season for planting wasn’t there yet, or already passed. It was too hot to be digging holes. It was too cold to be out digging holes. The ground where we wanted to plant was too hard/rocky/frozen/wet/etc. And the list goes on and on. But all that changed today. Today was the day. We decided not to wait any longer. Why? Why today and not two years ago? Was it because our local nursery was having a good sale? They have the same sale every year, so why now? It might actually seem counter-intuitive. We just moved onto our homestead property into a 33 foot trailer. We have no running water (we haul it ourselves in camping totes which we fill up at my parent’s house), and are getting by just fine with one 30watt solar panel for electricity (good thing it’s sunny 90% of the time in Nevada!). We still have belongings piled up in several places across our house pad, and barely even have the inside of the trailer put together yet. Some might say that now is precisely not the time to be worrying about planting trees. Tied to our awning support so they don’t blow over. But that’s not how we see it. If we had planted those cherry trees at our last house when we first started talking about it, we would have had several years of cherry harvest (weather permitting) before we moved. Now is the time. If we wait till the “perfect time,” (ie, once we build the house and get a well dug) we’ll miss out on years of growth and hopefully harvests. And that’s how it is with homesteading. There will never be a perfect time. If you’re thinking about starting a homestead, or adding something new to your existing one, or branching out into unknown skills; whatever it is, now’s the time to do it. Obviously, we all have obligations which we need to consider. The costs need to be counted and planning needs to be done. But there is always something you can do now, even if it is just the planning (rather than the dreaming). Find the small steps you can do to get you closer to your goal. Stop putting it off. Stop making excuses. For us, that means buying trees which we’ll have to water with buckets of gray water for the foreseeable future. It means we moved with two small children into a 33 foot camping trailer on property with no water or electricity. It means I got a part time job so we can afford the mortgage on the property as well as saving money to build. It means a lot of hard work and sacrifices. But in the end it will be worth it. Actually, no. In the process, it is already worth it. 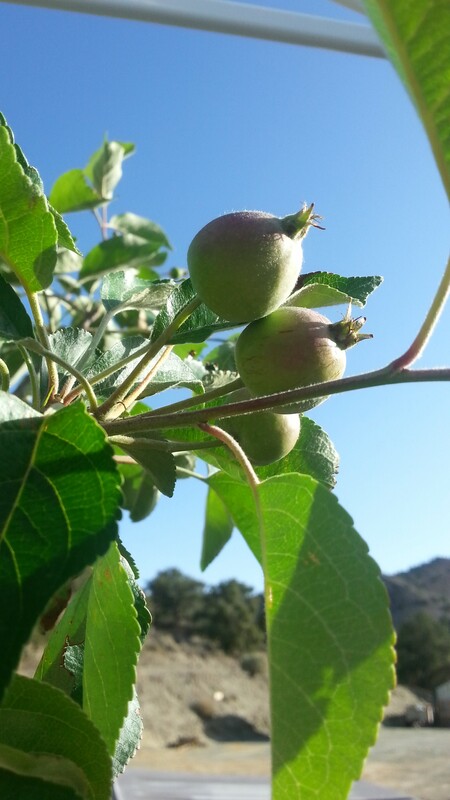 And every time I see those beautiful apple trees tied to the legs of our shade canopy (so they don’t topple over in our winds until we get them planted) I can’t help but smile and think of all the juicy apples and apple pies and apple sauce and apple butter and dried apples we’ll eventually have. And I’m proud of us for finally doing something to make it happen. So what are you waiting for? What can you be doing now it make this the time for going after your dreams? This entry was posted in Castle Rock Homestead, est 2014 and tagged Homestead on June 10, 2014 by Maridy.